Ah, the subconscious mind. It provides us with quick recall and access to our memories, and influences our habits and mood. It also processes what we take in through our senses, including how we perceive and react to colors. Why does a certain color make us smile? Feel calm? Anxious? Confident? Impulsive? The following chart shows, at a glance, the feelings that can be evoked by some of the basic color groups. 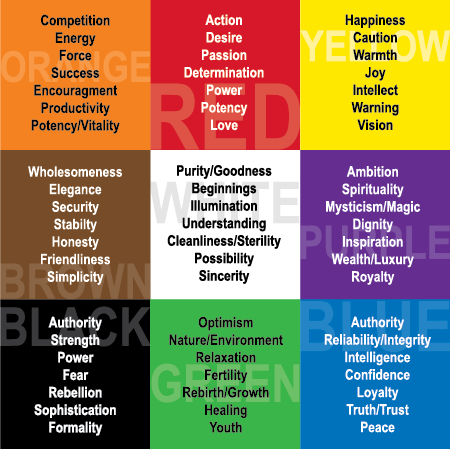 So, how does color affect human behavior? And how can marketers use this information to their advantage? Studies reveal that 93% of consumers rely on visual appearance when looking at new products, 85% say color is a primary reason for why they bought a product, and 90% say that their impulse buys are based on color alone. Marketers who understand the psychology of color and how it affects behavior can use that knowledge to advantage through the strategic use of color on packaging, signage, product materials, etc, causing a major impact on a consumer’s purchasing decisions. Black, light to medium blues, and hues of red and orange attract impulse shoppers. Traditional buyers tend to find lighter blues and shades of pink most attractive, while budget-conscious shoppers are attracted to darker blues and teals. Color can change our mood, improve our state of mind, even deepen a relationship with a brand – leading to a higher probability of long term brand loyalty. Armed with a little knowledge about color psychology, a savvy marketer can influence how their customers perceive their businesses and products— to evoke the best possible outcome for consumers. Have any questions? Give us a shout. We are a marketing firm that specializes in creative design strategies.